Can Goshen Provide Emergency Services to Legoland? It’s a question that’s been discussed on social media, written about in op-eds, and asked at public meetings—can Goshen provide emergency services to Legoland? The proposed park, which would cover 153 acres of a 523-acre site off Harriman Dr. in the Town of Goshen, could attract as many as 6,000 cars per day, and attract between 1.5 and 2.5 million visitors a year, the owners of the park estimate. In the company’s final scoping document, submitted Aug. 18, Merlin Entertainments PLC, the parent company of Legoland, stated the park could draw on the resources of the Goshen Volunteer Ambulance Corps, the village and town police departments, the Goshen, Chester, and Florida fire departments as well as the state police and the county’s emergency services. When representatives of these agencies were asked about their ability to provide services to Legoland, most said it would depend in part on Merlin’s plans to mitigate problems like traffic congestion, and how those plans worked once implemented. 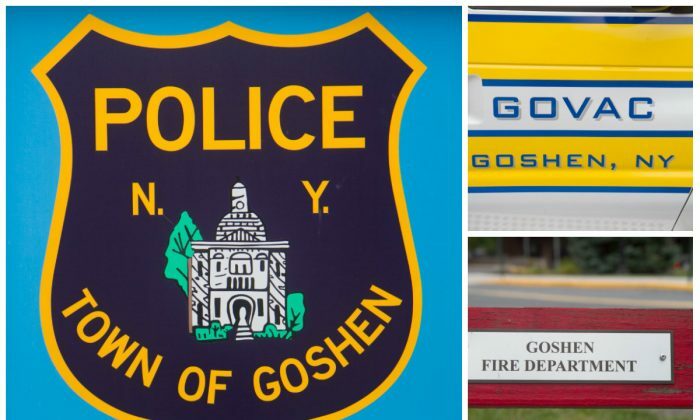 Town of Goshen Police Chief James McDowell said he does not see the park’s presence increasing crime in the area as some have feared, but does think the extra traffic will increase vehicle accidents. “Most likely more what I would consider fender bender-type accidents,” he said in a phone interview. The department will likely have to hire more police officers because of that, he said, which he believed would be offset by taxes or “proceeds” from the park. As for the fire departments, chairman of the Goshen board of fire commissioners, Al Turi Jr., said they have had “major fires” before, and he felt they were prepared to handle one at Legoland, both with their apparatus and the number of firefighters they have, if it happened. Their ladder truck can reach up to 100 feet, but none of the buildings would be taller than 90, he was told. As for having the human resources, he said nearby fire departments would help in the event of simultaneous fires. Goshen Volunteer Ambulance Corps (GOVAC) President George Lyons has said publicly he didn’t think Merlin’s initial traffic plan was adequate, and was concerned about access for emergency vehicles. Traffic congestion was one concern, and having an entrance and exit for emergency vehicles was another. I have to look at the final product before I would say it’s up to the specifications. “Now, it’s still a concern, but I have to look at the final product before I would say it’s up to the specifications that we need in order to get in and out of the area,” he said. There will most likely be medical staff on site, said Julie Estrada, a spokeswoman for Legoland in Carlsbad, California. The one difference between the other two parks and Legoland in Goshen, she said, is that Goshen’s ambulance corps is volunteer instead of paid. As for staff, GOVAC has about 18 active members, said Lyons, and they are desperately in need of more. He estimates he is on call about 2,000 hours a year, which is 500 more than what is considered a part-time job. One thing that Merlin suggested in its final scoping document is building a helipad on or near the project site for emergency evacuation via helicopter. Whether that will come to fruition is still being discussed, Estrada said. Merlin was aiming to have its Draft Environmental Impact Statement (DEIS), which addresses a lot of the issues of emergency services, into the town’s planning board “by fall” Estrada said, which officially started Sept. 22.